If the weather isn't cooperating, do what I did and cook a smoky prime rib roast in the oven. I know, I know, it's cheating...but it sure is easy and a great way to free up some time for holiday cheer. After a period of dry aging in the refrigerator, the roast was first roasted at a low heat level until hitting the target temperature. Then it was removed from the oven to rest, then placed back in the oven set at a much higher temperature to form the roast's crusty exterior. 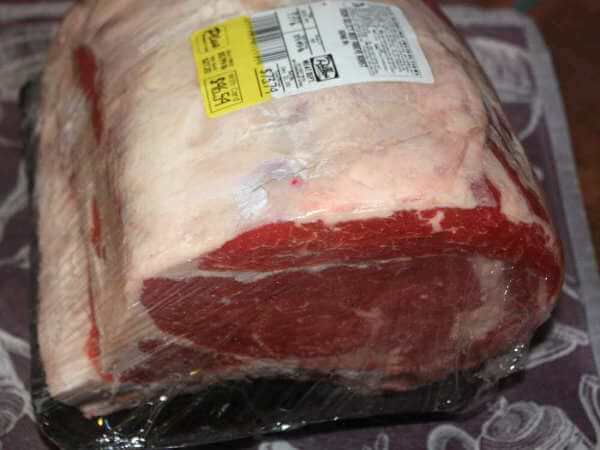 Since the weather outside today was just plain nasty, I decided to cook my New Year's Eve day prime rib indoors. For the smoky flavor, I rubbed the rib roast with liquid smoke seasoning, then seasoned with garlic powder, salt and black pepper. The roast was then covered with a loose fitting foil tent and placed in a 250F oven for about 3 hours. The internal temperature rose from 33F to 120F (my target temperature). 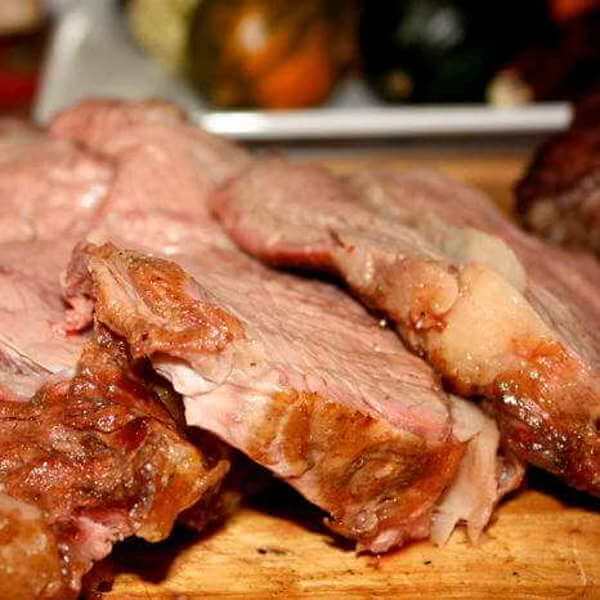 The smoky prime rib roast was removed from the oven and allowed to rest until the internal temperature reached 131F. The oven was preheated to 500F, and the prime rib roast was cooked for another 15 minutes to create a nice crust. That's what I did...here's the recipe. Dry age the rib roast in the fridge for two-to-four days in a large container, lightly covered with foil. Dry aging concentrates the flavor and tenderizes the meat. Preheat the oven to 250 degrees Fahrenheit. Insert a remote thermometer probe into the center of the roast. Cover the rib roast with a loose fitting foil tent. This prevents the outside of the roast from excessive drying as it cooks. Pop the roast into the oven. Roast that wonderful hunk of beef until the internal temperature reaches 120F, then remove it from the oven to rest. In twenty minutes or so, the internal temperature will rise to 130F. Crank up the oven temperature to 500F, and crisp the outside of the beef roast for ten minutes or so. Don't overdo it or the house will fill with smoke (like mine did!). Remove the roast from the oven and cover it with the foil tent until ready to serve. The interior of the roast should be perfectly cooked to a beautiful medium rare. Enjoy!